Heat oven to 450°F. Spray 13x9-inch (3-quart) baking dish or 3-quart casserole with cooking spray. Spread spinach in baking dish. In medium bowl, stir Potatoes, Sauce Mix, boiling water, milk and 1 tablespoon of the butter. Spread potato mixture over spinach. Place chicken breasts on potato mixture. Drizzle chicken with remaining tablespoon of butter; sprinkle with Italian seasoning and salt. Place tomatoes around chicken in dish. Bake uncovered 25 minutes. Sprinkle with cheese. Bake 3 to 5 minutes longer or until cheese is melted and juice of chicken is clear when center of thickest part is cut (at least 165°F). Let stand 5 minutes. Sprinkle 1/4 teaspoon crushed red pepper flakes on the chicken along with the salt and Italian seasoning for a little extra heat. 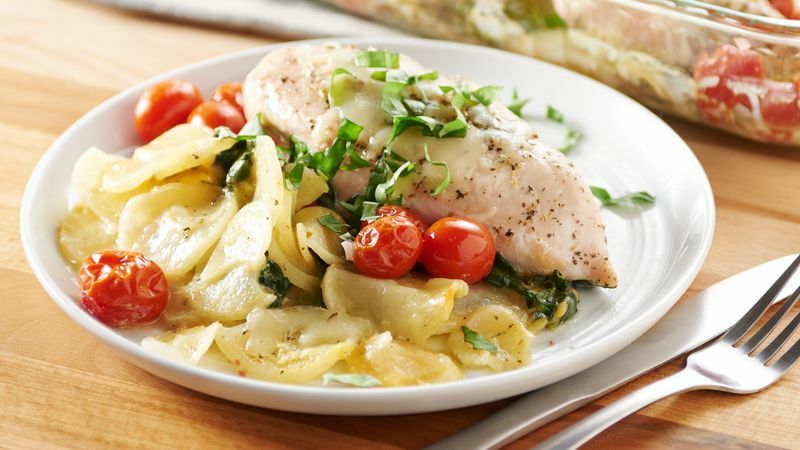 Add even more color and flavor to this easy dinner by topping with some chopped fresh basil leaves before serving.